Many at times you wanna enable voice calls or increase the speed on your huawei modem or Maybe you desperately entered wrong code 10 times and huh your huawei modem is now locked permanently to a particular network and you think all hope of unlocking it is gone. Here is where the tutorial was originally posted and it is about how to reset the unlock count of permanently locked huawei USB modem to zero. You can read on for the solution or simply download the tool to help you reset your modem unlock counts. 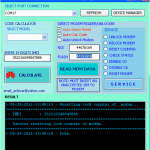 Restart usb modem user interface from desktop and many more.